Sue Fuller’s String Composition 128 1964 testifies to the often overlooked influence of craft traditions on the development of modernist abstraction. Made from coloured synthetic threads woven into a complex kaleidoscopic pattern, String Composition 128 is a prime example of Fuller’s mesmerising abstract constructions from the 1960s. 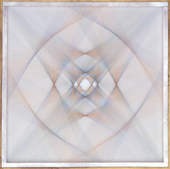 The American artist first developed her distinctive stringing technique in the late 1940s, and while her works were featured in important exhibitions during her lifetime and acquired for museum collections, the difficulty of classifying them in relation to more traditional artistic media has arguably contributed to the waning of scholarship on her innovative works. This In Focus offers new research on Fuller’s string compositions, examining how they developed from her printmaking and collage work and in particular from her technical investigations into soft ground etching. It reveals her sophisticated engagement with craft traditions – including stringing, knotting and lacemaking – and the social and industrial contexts in which her work can be understood. Finally, it explores the ties that were established between Fuller’s string compositions and op art and the reception of her work in Britain in the 1960s. Published in September 2018, the project is authored by Alex Taylor (University of Pittsburgh) with contributions by Christina Weyl (independent art historian) and Frances Follin (independent art historian).